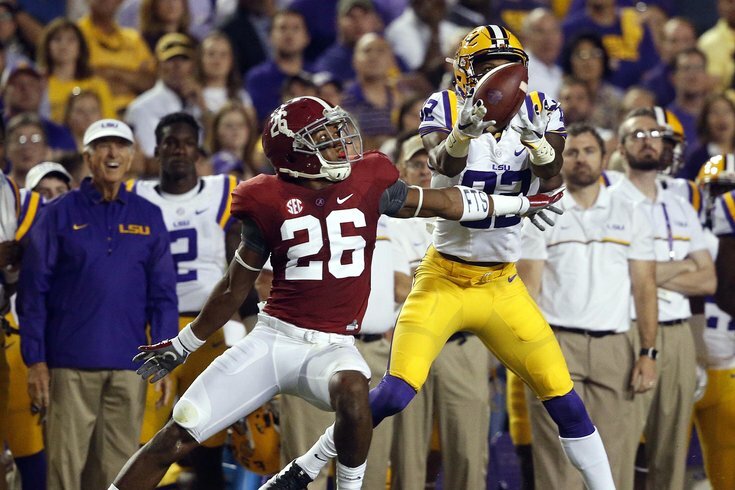 Alabama CB Marlon Humphrey is a likely first round pick. Jordan Thomas, CB, Oklahoma (6'0, 192): (10) Oklahoma State at (9) Oklahoma, 12:00 p.m.
By my count, the Eagles have gotten nine combined seasons in which those players were clear, regular starters on the Eagles' defense. If you want to include slot corner as a starter, then go ahead an add three more for Brandon Boykin. The point here is that the Eagles haven't found a home-grown, quality defensive back in the draft in almost 15 years, and as the chart above shows, they sure have tried. MORE ON THE EAGLES: Eagles-Bengals injury report, with analysis | Eagles vs. Bengals: Predictions, betting lines and TV/radio broadcast info | Eagles vs. Bengals: Five matchups to watch | Why can't the Eagles' pass rushers get to the quarterback? | Who will be the Eagles' cap casualties after the 2016 season? The other thing they haven't done since 2002 is take a defensive back in the first round of a draft. This could be the year, as there could be a lot of high-quality corners that come off the board in round one of the 2017 NFL Draft. There may be three playing in the SEC Championship Game today, in Alabama's Marlon Humphrey, Florida's Quincy Wilson, and Florida's Jalen "Teez" Tabor (previously profiled here). We'll get to Humphrey and Wilson in a minute. The off-field decision making McShay referred to includes two different suspensions, as well as an arrest for failing to appear in court after receiving a speeding ticket for driving 94 MPH. He was also arrested in June on charges of "assault and battery, public intoxication and interference with official process." The Eagles showed last offseason that they were willing to draft character concern players, when they selected Wendell Smallwood, Jalen Mills, and Alex McCalister. On the field, Thomas hasn't been nearly as good in 2016 as he was in 2015. CFB Film Room has him down for six touchdowns and 471 yards allowed this season, with no interceptions. Not good. Thomas might be best served to stay in school and regroup from a bad season, but if he comes out he could be a bargain in the mid- to late-rounds. Marlon Humphrey, CB, Alabama (6'1, 196): (15) Florida vs. (1) Alabama, 4:00 p.m.
Quincy Wilson, CB, Florida (6'1, 213): (15) Florida vs. (1) Alabama, 4:00 p.m.
As mentioned above, another potential first round corner playing in the Florida-Bama game is Quincy Wilson, Florida's "other" corner opposite Jalen Tabor. Or IS he the "other" guy? According to at least one NFL executive, Wilson is the best cornerback in the country. "I think Wilson is the best corner in the country. Tabor gets all of the hype but Wilson is better in every area," an NFL executive told NFL.com analyst Daniel Jeremiah. Scouts descending on Florida's campus expect to come away convinced that Teez Tabor is the Gators' top cornerback prospect, but I've been hearing that UF's Quincy Wilson might be garnering more attention as a potential CB1. The 6-foot-1, 213-pounder has excellent size and length. He's a technician who's capable of snuffing out elite receivers on the island. An AFC college scouting director raved about Wilson's "physicality, toughness and instincts." In addition, he loved Wilson's competitiveness and that he asked coaches to allow him to take on the opponents' top receiver in certain games (see Ole Miss and Laquon Treadwell). Humphrey, Wilson, Tabor, Washington's Sidney Jones, USC's Adoree Jackson, Iowa's Desmond King, Michigan's Jourdan Lewis, Tennessee's Cam Sutton, Clemson's Cordrea Tankersley, and LSU's Tre'Davious White lead a very impressive group of corners set to enter this draft. Jarrad Davis, LB, Florida (6'1, 238): (15) Florida vs. (1) Alabama, 4:00 p.m.
Kendricks will count for $6,600,000 against the Eagles' cap next year, $1,800,000 of which they can save if they cut or trade him. While $1.8 million isn't exactly a huge savings, if the Eagles can get something like a late draft pick in return for him, it might be worthwhile cutting their losses and drafting a rookie linebacker who can give the Birds similar or better production at a lower cost. Davis' stats aren't eye-popping, and are perhaps a little misleading, as he often makes big plays that don't show up in the stat sheet. When former Alabama Heisman-winning running back Derrick Henry was asked who the toughest player he ever faced was (and he saw his share at Bama), he named Davis. There are some who believe Davis is a potential first round pick. I don't see that, however, in the second round Davis might make sense for a team in need of added linebacker help that plays in the same division as Ezekiel Elliott. Wayne Gallman, RB, Clemson (6'0, 215): Virginia Tech vs. (4) Clemson, 8:00 p.m.
With 60 career receptions, Gallman also has some receiving ability. He does a nice job catching the ball with his hands and then immediately transitioning as a runner. That has to be a skill set that will intrigue the Eagles in the screen game.